141 Eyewear partnered with Kaiser Permanente and the Boys & Girls Club of Salem to hold an Eye Care Event. The goal was to protect sight by increasing community awareness, uniting eye care professionals and eliminating the lack of access to visual healthcare in underserved communities. Doctors, Opticians, and Optometric Technicians volunteered from all over Oregon to help give these children comprehensive eye exams and complete prescription pair of 141 eyewear for those who needed them. According to the World Health Organization, 153 million people cannot see simply because they do not have access to corrective eyewear and/or cannot afford proper vision care. 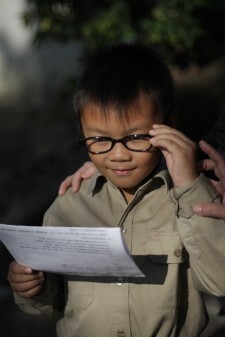 We have seen first hand what it is like for many of these children and adults to live without glasses. Children cannot see the blackboard clearly; as a result, they lose interest in school and hinder their chances of realizing their potential. For many adults, work is difficult to find and many everyday activities such as reading a book are not possible because these people simply cannot see clearly. But when a child receives a pair of glasses, suddenly the blackboard becomes clear. Schoolwork gets better. Participation in extracurricular activities gets better. Life gets better. For adults, finding work is easier. Books and newspapers become readable. Faces of loved ones become recognizable. The ability to commute gets better. Life gets better. Something as small as a pair of glasses has the power to change a person’s life and open up a whole new world of possibilities. In early summer 2009, while discussing eyewear and the possibility of starting our own company, we decided that we would change the optical industry by the way we do business. We were on a mission to share our passions for eyewear and giving by creating a for-profit company with a non-profit soul. For every pair of glasses we sell, we would give a pair to a person in need. Plain and simple. Imagine what the world would look like if every one of us took a portion of what we know and what we’re passionate about, and gave it to someone else in need. We would collectively change the world. It is that vision which inspires our design, mission, and movement.